Inter Cooler designed and manufactured by I.T.C. follows the ASME Section VIII Division 1 requirement as guideline. All the vessels are made of A516-Gr70 metal sheet (ASTM standard) submerged arc welded along body and head seams. Inert gas (Nitrogen) tests at 17.5 bar(g). There are vertical (ITCV series) and horizontal (ITCH series) tpyes to suit the installation area. Third party inspection can be accomplished as per Body_1itional extra cost. ITC builds Pressure Vessel Intercooler from A516-Gr70 metal sheet (ASTM standard) and follows the guidelines of ASME section VIIl division 1 requirements. Also, it is capable to operate at below -30℃. 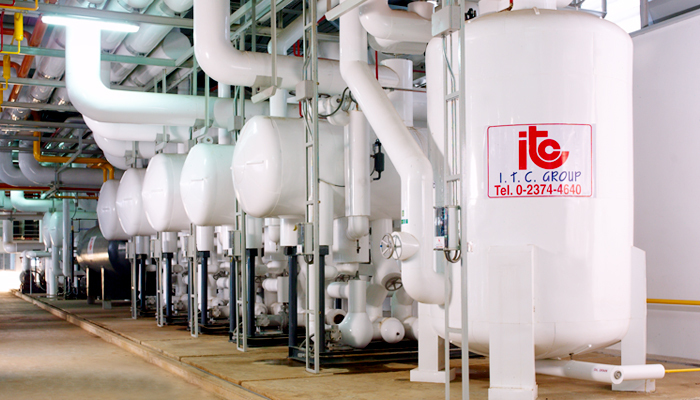 This type of vessels has two series: the vertical model (ITCV series) and the horizontal model (ITCH series). For convenient, customers can request the vessel’s capacity depending on what most suites the installation area and our customers’ specification. Furthermore, the ammonia pump (optional) can regulate the ammonia to flow inside the refrigeration system. The control panel, which consists of the dry run protection, TRG meter and starter, can secure the temperature monitoring, alarm, flow rate and the level of liquid circulation. ciency and especially reasonable price.